We have exceptional offers on all of our demonstrators. 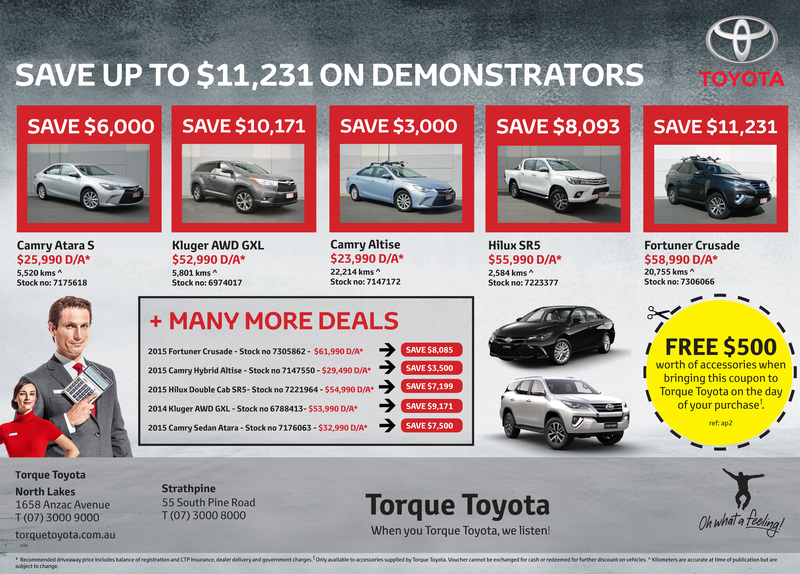 Don’t miss out and save up to $11,231 on the following vehicles plus benefit from $500 worth of accessories when bringing the yellow voucher on the day of your purchase. * Recommended driveaway price includes balance of registration and CTP insurance, dealer delivery and government charges. † Voucher is only available to accessories supplied by Torque Toyota and cannot be exchanged for cash or redeemed for further discount on vehicles. ^ Kilometers are accurate at time of publication but are subject to change.